It was young people’s day during my brief time in the Salvation Army when members of the young people’s section were invited to give their heart and dedicate their life to Jesus. Toward the end of the meeting the Young People’s Sergeant Major – the Leader in charge – made her appeal presenting us with the opportunity to start out on the road of discipleship. The journey would begin, she explained, by our being saved or, if we were already committed, to rededicate ourselves to the service of Jesus. She wanted us all to be saved by accepting Jesus as Lord and Saviour. Salvationists were well accustomed to this kind of appeal. The worshipper who was challenged by the message and felt compelled to respond to this altar call would make their way to the front and as invited, kneel at the penitent form. They would arise, counselled, prayed over, their request confirmed – the process of salvation begun. That was it until . . . . . . . . .
One Sunday evening some years later, the minister was trying to educate the inattentive members of the youth fellowship in the traditions of Methodism. 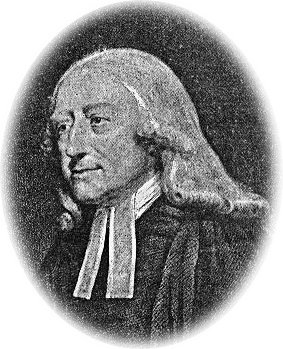 He was telling the story of the Kingswood colliers coming up from a shift underground hewing coal, to be confronted by the Reverend John Wesley preaching the good news – the gospel of grace. The picture is still vivid in my memory of those men, white channels marking their coal-dust faces where the tears flowed as they listened and opened their hearts to the Spirit of Jesus. How their lives were transformed, some of them converted into preachers, others to positions of influence at work and in the community at large, partners in the religious revival led by the Wesleys, a revival that helped give birth to Methodism. This late 18th Century revival helped to turn the minds of the English people from thoughts of revolution, although not all historians agree. Prayer: Lord, we thank you for our spiritual awakening, for those who pointed us to Christ, those in whose lives we caught a glimpse of Jesus. Thank you for Jesus, all he means to us; our hope for days to come. Amen. This entry was posted in Church leaders, John Wesley, Methodism, Organisations, Salvation Army and tagged Grace, Jesus, John Wesley, Methodism, Prayers, Religious revivial (18C), Salvation, Salvation Army on May 15, 2013 by Anabel @ The Glasgow Gallivanter.